We all play a critical role in fulfilling our mission, promise and values. At Streck, we hire driven and talented individuals to shape the future of clinical diagnostics. Every employee of Streck plays a critical role in fulfilling our mission, promise and values. Streck manufacturing, laboratories, administration, R&D and customer services work daily to expand the reach of medicine and improve the quality of life worldwide. We strive to offer a satisfying employment opportunity with an environment that promotes career advancement and growth. With the support of our innovative culture and inclusive working atmosphere, our employees are able and willing to take ownership of their work and contribute to the future and longevity of Streck. Everyday, more than 13,000 labs in over 60 countries count on Streck to validate results and uphold their reputations. Everyone at Streck, from boardroom to shipping bay, is committed to making accuracy and consistency reliably routine. Integrity – We are unwavering when it comes to doing the right thing. Creativity – We transform ideas in to solution-based products that advance the health of patients. Customers – We provide a customer experience that results in lasting satisfaction. Employees – We provide a respectful, challenging, positive work environment where teamwork leads to success and personal growth. Community – We support our community by giving of our time, talent and financial resources. Quality – Taking pride and ownership in the work we do; good enough is not an option. It has to be the best that we can do. How would you describe Streck’s culture? What is your “Streck Story”? What is the culture at Streck? How would you describe your coworkers? We are dedicated to providing our employees with a competitive compensation that rewards employees based on their performance. The program is compliant, fair and a reflection of Streck’s financial performance. The system is designed to be objective and non-discriminatory in theory, application and practice. Streck recognizes benefits are an important part of our employees’ lives. Each year, our benefits team works hard to carefully consider the benefits we provide. We research ways to maintain the quality of our plans and at the same time meet the needs of our employees and their families. As an organization, we work hard to create an environment that educates and encourages our employees to live healthier lives. Employees are able to participate in and earn incentives through various activities that promote healthy living inside and outside the work place. Teams of Streck employees participate in wellness promoting activities within the Omaha area including: The American Heart Association Heart Walk, American Lung Association Corporate Cup, Juvenile Diabetes Research Foundation Walk to Cure Diabetes, Leukemia and Lymphoma Society Light the Night Walk and Trek Up the Tower. We strive to make Streck an enjoyable place to work. We offer a variety of activities that tie our employees together, promote a team-oriented culture and recognize our employee’s success. One of the qualities Streck values most is our workforce diversity and strives to have an inclusive environment. We believe the diverse backgrounds, experiences and skills that our employees possess make up the uniqueness and difference at Streck. Streck thanks the men and women who have served our country. We appreciate the sacrifices endured to preserve our freedom. We recognize and value veteran employees within our doors and provide opportunities, support and development to the veteran population in the community. Streck is an Equal Opportunity/Affirmative Action employer and forbids discrimination against any employee or applicant because of race, color, religion, gender (including pregnancy, gender stereotyping and caregiver status), sexual orientation, gender identity, transgender status, national origin, disability, genetic information, citizenship, marital status or status as a covered veteran in accordance with applicable federal, state and local laws. Streck recognizes that it is our responsibility to be a contributing corporate citizen and use our time, talent and financial resources to help enrich our surrounding communities. Through Streck’s Volunteer Time-Off benefit, we encourage our employees to become involved by lending their voluntary support to programs that positively impact the quality of life within our communities. Streck’s summer employment program offers individuals meaningful real-world experience, training and professional growth. We seek ambitious, enthusiastic, and talented candidates for positions within multiple departments across our organization that will exemplify and complement our innovative culture. Summer Activities: In addition to the meaningful work the summer employees do, we have activities planned to encourage our intern and assistant team to network, train professionally and explore the exciting activities Omaha has to offer! Interns and assistants will be invited to participate in social, community and developmental events. Company Paid Housing: Streck provides housing to employees who live at least 60 miles outside of the La Vista area, for the duration of summer employment. Summer employees are housed at the University of Nebraska – Omaha in the on-campus dormitories. The campus is in the heart of Omaha, surrounded by dining, shopping and event centers. Our summer employment program runs mid-May through the beginning of August. Recruitment for internship positions begins late fall and recruitment for assistant positions begin early spring. Visit www.streckcareers.com to view our available summer #internship and assistant positions. 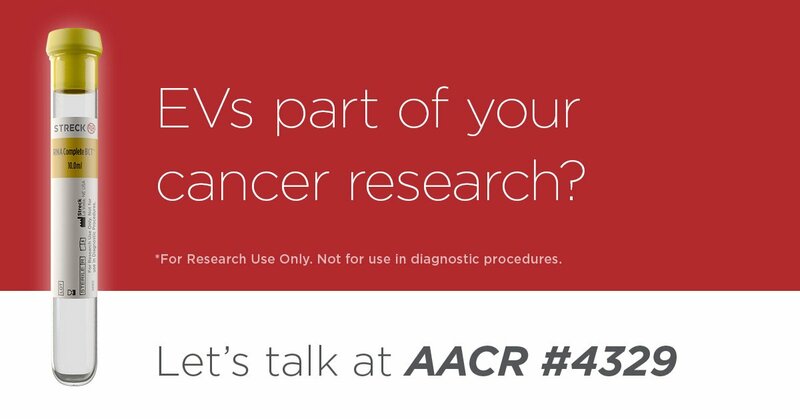 Heading to #AACR19? Stop by booth 4329 to learn about how our new blood collection tube can help in your #exosome and #cfRNA cancer research. Looking for more information on our career opportunities? Submit your questions/comments here and our recruiters will get back to you shortly. We got your message and we’ll contact you soon.